People with fixed mindsets believe that fundamental qualities like intelligence are essentially stable; people with growth mindsets believe that such qualities can be developed and nurtured. Research shows that learners with growth mindsets are more: open to challenges and constructively critical feedback; resilient in the face of obstacles and failure; convinced that effort makes a difference; able to learn well with and from others; likely to succeed. If we can foster growth mindsets in our pupils the results will be transformative. 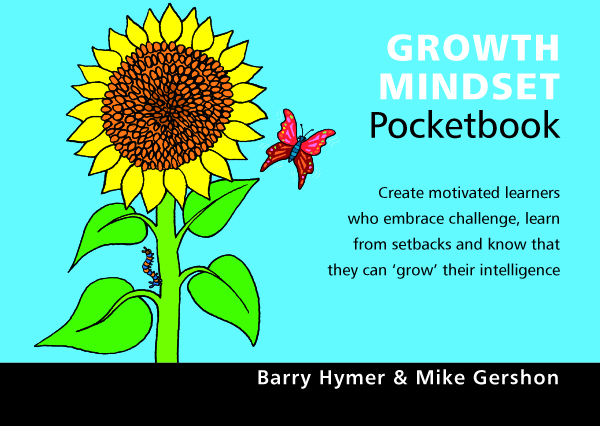 The Growth Mindset Pocketbook is full of classroom strategies for doing just that. Barry Hymer and Mike Gershon look at high-challenge tasks and the value of errors, mistakes and failure; exactly what we mean by effort and how to make that attractive to students; great feedback; the power of language; and ‘going seriously meta’ – equipping students to think about their own thinking and learn about their own learning. Get the book; get growing!